Don’t forget accessories when you pack for college. A little piece from home will make your surroundings when you are away, seem more familiar and comforting. For example, photos in picture frames. 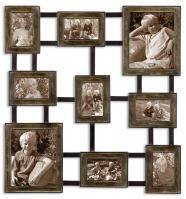 Collage frames are a great way to display photos of loved ones and friends from home. Decorative boxes are great for storage and will add to the decor of your room. Plants in small pots and planters will make your room seem more at home. Wall shelves and hangers will organize your space. Don’t forget nice touches like a vase for flowers, a reed diffuser and of course a mirror. For more great ideas visit www.cheapchicdecor.com.